Subject: Why Is the South China Sea Important? 5 + = six Required Please enter the correct value. 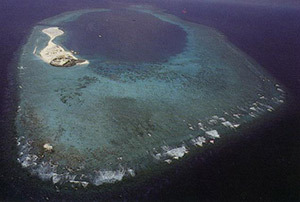 Located in the center of the South China Sea is a small, innocuous group of uninhabited island atolls named the Spratly Islands. Exactly why is the South China Sea important? And the Spratlys are claimed by no fewer than seven different countries. "This is definitely a situation you want to watch closely," Money Morning Executive Editor Bill Patalon told readers on Dec. 8. "Any kind of a major 'incident' there will clearly have a big – and negative – impact on the world financial markets." The South China Sea region includes more than 200 small islands, rocks, and reefs, with the majority located in the Paracel and Spratly Island chains. Many of these islands are partially submerged islets, rocks, and reefs that are little more than shipping hazards not suitable for habitation; the total land area of the Spratly Islands is less than 3 square miles. The islands are important, however, for strategic and political reasons. Ownership claims to them are used to bolster claims to the surrounding sea and its resources. To that end, the region is the world's second-busiest international sea lane – more than half of the world's supertanker traffic and 30% of all global maritime trade passes through its waters. Tanker traffic through the Strait of Malacca leading into the South China Sea is more than three times greater than Suez Canal traffic, and well over five times more than the Panama Canal. 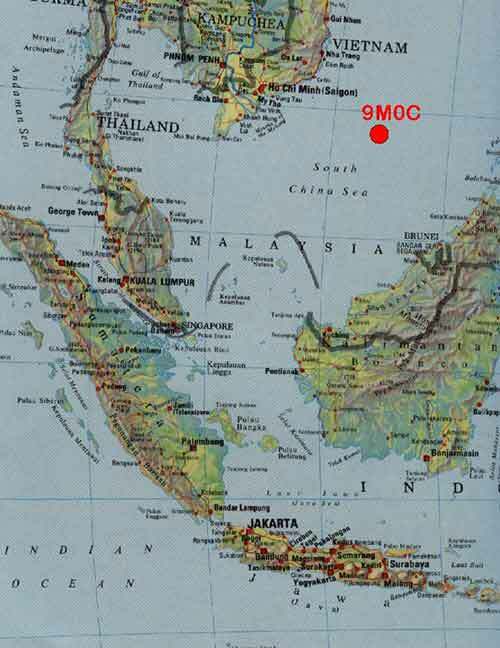 Virtually all shipping that passes through the Malacca and Sunda Straits must pass near the Spratlys. The large volume of shipping in the South China Sea/Strait of Malacca littoral has created opportunities for attacks on merchant shipping. With the exception of 2007 to 2012, when piracy in East Africa spiked, the South China Sea has been the most piracy-prone region in the world, with up to 150 attacks annually, according to the Center for International Maritime Security on Sept. 6, 2014. Shipping (by tonnage) in the South China Sea is dominated by raw materials en route to East Asian countries. Tonnage via Malacca and the Spratly Islands is dominated by liquid bulk such as crude oil and liquefied natural gas (LNG), with dry bulk (mostly coal and iron ore) in second place. LNG shipments through the South China Sea constitute two-thirds of the world's overall LNG trade. 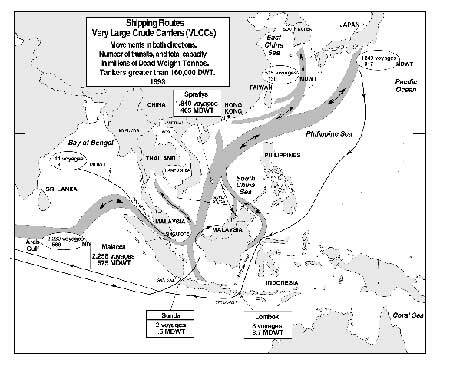 Nearly two-thirds of the tonnage passing through the Strait of Malacca, and half of the volume passing the Spratly Islands, is crude oil from the Persian Gulf. Rising Asian oil demand could result in a doubling of these flows over the next two decades. Additionally, the Spratly's themselves contain oil and gas resources strategically located near some of the world's largest energy-consuming countries, such as China, India, and Japan. In its World Oil Outlook released on Dec. 23, 2015, OPEC estimated that global energy demand will increase 50% by 2040, with gas and oil expected to supply roughly 53% of energy demands. The Asian region accounted for much of that total demand. In 2015, total global oil demand reached 94.6 million barrels per day (BPD). Nearly a third of total demand went to the Asian-Pacific and Americas regions, according to Statista. Imports to sate Asia's growing energy needs will largely pass through the strategic Strait of Malacca into the South China Sea. As it is, over half of the world's merchant fleet (by tonnage) sails through the South China Sea every year. CHINA AND CHINA ALONE IS THE ONE PROVOKING IN THE CONTESTED SOUTH CHINA SEA AREA. CHINA KNOWS THEY ARE SERIOUSLY PROVOKING ECONOMICALLY AND MILITARILY WHEN THEY BUILT THE FAKE ISLANDS. China is just building Fake Islands in South china sea contested area and then claim it as theirs sovereign area. They are using their military power to scare those countries that opposes of their activities in South china sea. SCARING TACTICS BY CHINA.China is using reverse psychology by blaming other countries of provocation in South china sea so as the World will not see China as the sole instigator in SCS by building Fake islands near or in the INTERNATIONAL SEA LANE. CHINA IS VERY GREEDY, SELFISH, AND DECEITFUL COUNTRY. CHINA's SERIOUS PROVOCATION IN CONTESTED AREA OF SOUTH CHINA SEA MUST BE STOP SO THE WORLD WILL BE ABLE TO LIVE AT PEACE. Thay must be stop at all cost. China: beware, you might be the most populous country in this tiny planet. But there is someone who created all things who we call GOD and HE does'nt agree with you. Are you warning GOD to not bother you at the West Philippine Seas? I just heard that He is going to send the seas west of the Philippines to your country, China. So you want the west Philippine seas to go to China? That He is going to do the earliest time ASAP. Watch, you greedy Chinese people from China.